Canadian journalist Lauren Southern and philosopher Stefan Molyneux have launched their Australian tour in Melbourne on Friday night. Speaking out against a failed policy of multiculturalism in many Western countries and promoting the need for an inquisitive mindset, the speakers were met with violent protests from socialist groups. 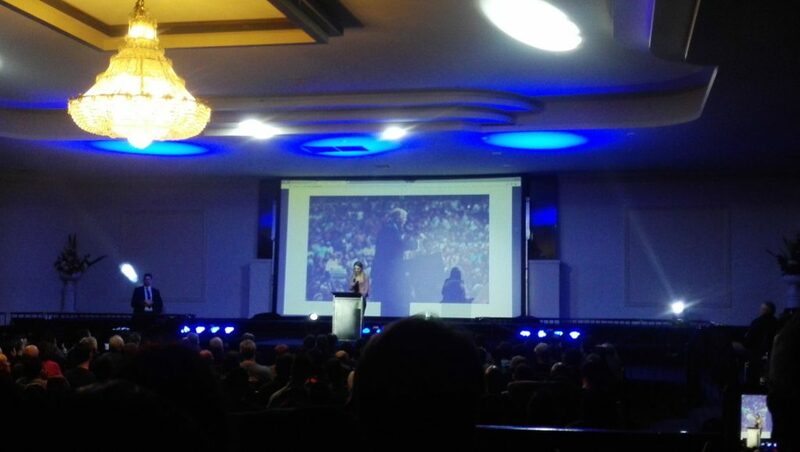 Despite Southern’s earlier release of YouTube video showing several members of the public wanting to kill her for her political views, the 23-year-old former Canadian Libertarian Party candidate and fellow Freedomain Radio host Stefan Molyneux spoke to an audience of nearly 1000 strong. Despite heightened security at Somerton’s La Mirage Reception and Convention Centre in Melbourne’s northern suburbs, over a hundred protesters attacked buses and patrons arriving at the venue. Victoria Police’s Counter Terrorism Unit advised tour organisers Axiomatic Events to withhold revealing the exact location of the site until the day of the event. In a statement sent to ticket holders, Axiomatic criticised left-wing activists for attempting to disrupt the event. Police have hit Axiomatic with a bill of $68,000 leaving Southern to question whether the Police are acting indirectly to support the violent protests. The violent scenes that blocked the Hume Highway and interruptions by protestors during the event were not enough to dampen the audience’s spirits with many lining up to purchase Southern’s book Barbarians: How Baby Boomers, Immigrants, and Islam Screwed My Generation. Notable Australian activists Neil Erikson and Blair Cottrell were also part of the audience. Not shy to address controversial subjects and to break political correctness, Southern focused heavily on the conflict between multiculturalism and free speech. Drawing on examples from Europe, the former Rebel Media journalist said that “the nation that belongs to everyone belongs to no one” and remarked that it is not possible to have free speech alongside cultures that do not hold such values. “Giving ISIS vegemite won’t stop them wanting to form a caliphate,” said, Southern, just before several protesters were ejected for interrupting her speech with megaphone siren. Further protesters were removed after an outburst of “refugees are welcome” in response to Southern’s questioning of the Australian government’s policy of multiculturalism. “Why not just say Australia is a Western country based on Western values?” questioned Southern before a protester attempt to tackle her as she concluded her speech. With a standing ovation, the audience cheered as the Canadian thanked her supporters as the final protester was carried out of the venue. Fellow Canadian Stefan Molyneux took to the stage also to much fanfare but without the protests began to speak on the left-wing narrative surrounding Indigenous Australians. Also emphasising the need for humility in the pursuit of truth, the philosopher claimed that “people who are certain are almost certainly wrong”. The philosopher also challenged notions of “white guilt” especially regarding the treatment of Indigenous Australians, claiming that it was within Aboriginal traditions to have committed infanticide to thirty to fifty percent of their population as opposed to any mass European led genocide of the population. Molyneux also dismissed that notion of collective responsibility saying that “the only thing the West should be ashamed of, is having shame”. In the subsequent question and answer forum, both Southern and Molyneux used the opportunity to reiterate the need for free speech as well as criticising attempts to shut down dissenting ideas often through violence as regressive. Southern who recently also recently released her documentary Farmlands highlighting the attacks on white farmers in South Africa said that it alternative media was on the ascendant with the mainstream media refusing to cover such situations. One protester was arrested for assaulting Police. Axiomatic will be hosting the next leg of the tour in Perth tonight with events other cities including Sydney and Auckland coming up.